The Drop Redoubt is one of the two forts on Western Heights; the other is the Citadel, and the two are linked by a series of dry moats (or lines). It is arguably the most impressive and immediately noticeable feature on Dover’s Western Heights. The artillery at the Redoubt faced mostly inland – it was intended to attack an invading force attempting to capture Dover from the north-east. The construction of the Redoubt was in two periods, the first being from 1804-1808 during the Napoleonic Wars, the second from 1859-1864 following the recommendations of the 1859 Royal Commission. The original form of the Drop Redoubt was a simple pentagon, formed by cutting trenches into the hillside and revetting (facing) them with brickwork. Thus the Redoubt was a solid ‘island’ with barracks, magazine and artillery on top. Originally it would have accommodated 200 troops, but by 1893 the numbers had been reduced to just 90. A striking feature of the first period is the Soldiers’ Quarters – five bomb-proof brick vaulted casemates. These are parabolic in cross section and covered in a thick layer of earth to withstand the effect of mortar-bombs. The windows at the rear of each open into a trench to protect them against blast. The rise of Napoleon III during the 1850s caused a further invasion scare, and a Royal Commission was set up in 1859 to assess the defences of Britain. 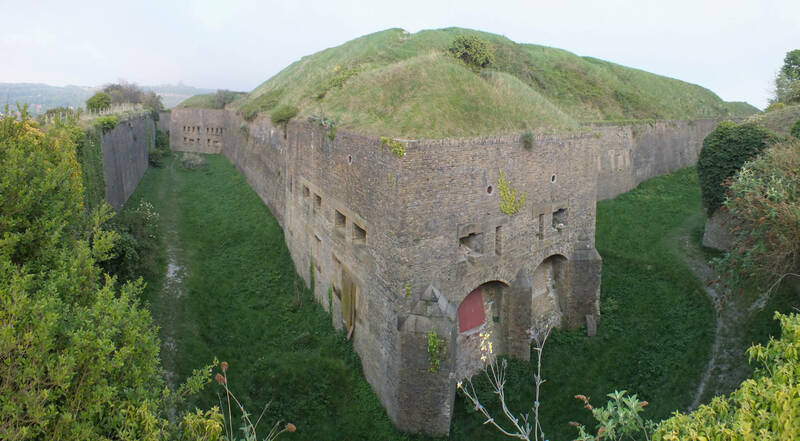 As a result more work was deemed necessary at the Heights, and the Drop Redoubt had its defences improved. Caponiers were added to four of the corners of the existing fort (each with a stone staircase leading up to the top of the Redoubt), and gunrooms were built adjacent to two of them to allow fire along the North and South-East Lines. The original magazine was enlarged and covered with a large earth bank as protection from mortar fire. The Officers’ Quarters, Guardroom and cells also date from this period. They can be distinguished from the earlier work by the semi-circular shape of their brick vaulted arches. By 1902 the heavy guns had been removed and the fort became the residence of the infantry bands attached to the battalion in residence at the Grand Shaft Barracks. During World War I it housed searchlights operated by the Dover Anti-Aircraft Corps, and in November 1917 a German U-Boat crew were held prisoner there. The fort was largely abandoned between the wars. 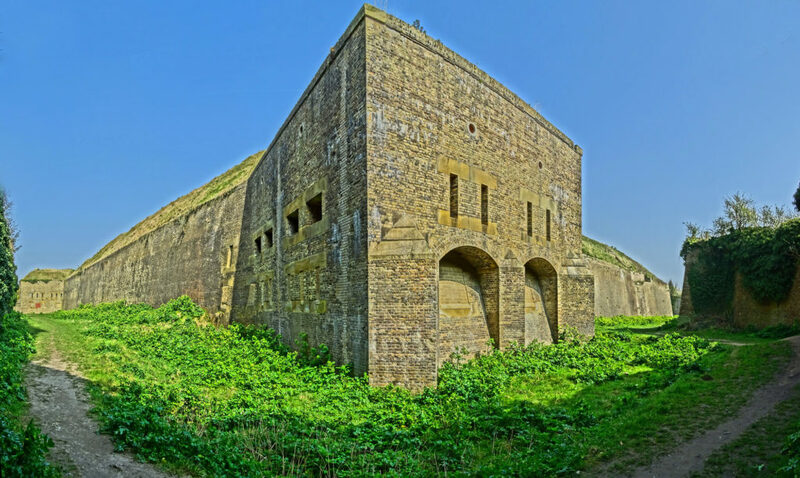 During World War II, the Redoubt became a look-out post where the long-range shelling of Dover from France was plotted. In April 1942 it housed 100 Commandos and 60 Canadian infantry who undertook a raid to the shore of Hardelot, France under the command of Lord Lovat. In 1945 the site was abandoned permanently. 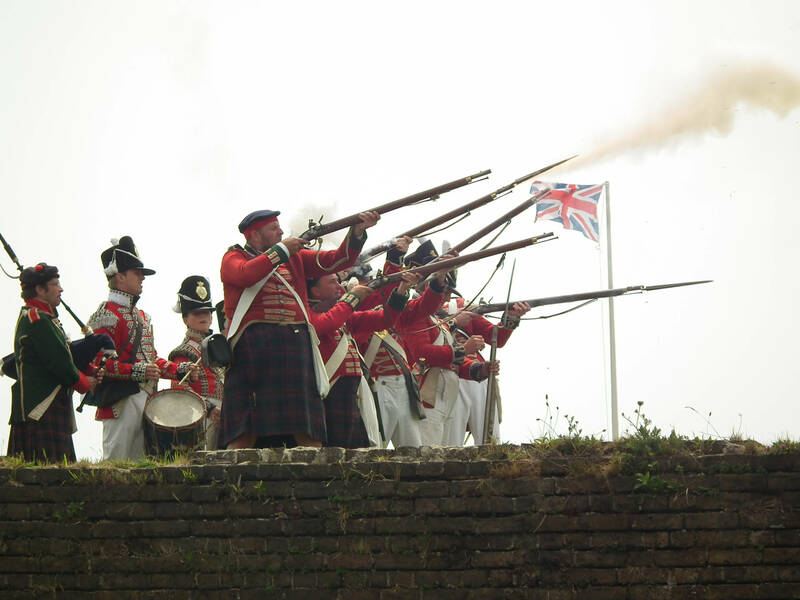 Originally the redoubt was to be equipped with 12 smooth bore 24-pounder guns and two carronades. However, it is unlikely that many were installed since the Napoleonic Wars were almost over by the time phase one construction was completed. In 1851 only three 24-pounders were in place, along with six 12-pounder saluting guns and an 8” mortar. For phase two construction eleven Armstrong 110-pounder Rifled Breech Loaders were installed on traversing carriages. These proved unsatisfactory and a return was made to muzzle loaders. In 1914 two Hotchkiss 6-pdr QFs (quick firing guns) were mounted just outside the fort and during World War II it was to be protected with Anti-Aircraft Bren guns, a mortar, grenades and Molotov Cocktails. On top of the redoubt are the remains of a Roman Pharos or lighthouse, which complemented the one still extant in the grounds of Dover Castle. Both date from the 2nd Century AD, and would have been similar in design. Its remains were lost during the first phase of construction, but were re-discovered during the second phase and restored to its approximate original position (now on the ramparts) as a rather shapeless lump of masonry. The foundations can now be seen in a room immediately below, now part of the Victorian officers’ quarters. Local names for the remains of the Pharos are the ‘Bredenstone’ or the ‘Devil’s Drop of Mortar’, and it was here that until 1914, the Lords Warden of the Cinque Ports had their installation ceremony. It is likely that the name ‘Drop Redoubt’ originates from the local name given to the ruins of the Pharos. 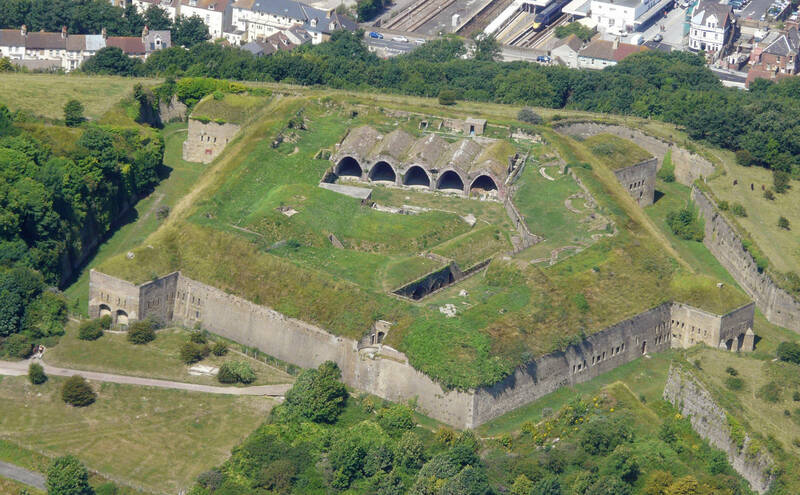 Today the Drop Redoubt is under the care of English Heritage and has been opened by the Western Heights Preservation Society through the summer months since 2003. In the summer of 2018 we were very lucky to have the opportunity to have the site fully mapped by drone by ATEC-3D. This allows people an unparalleled view and opportunity to explore the site from a multitude of angles.